Love your local Markets campaign culminates with Mayor's visit A visit from the Mayor and Mayoress of Rotherham to the towns markets was the culmination of the Love Your Local Markets campaign. 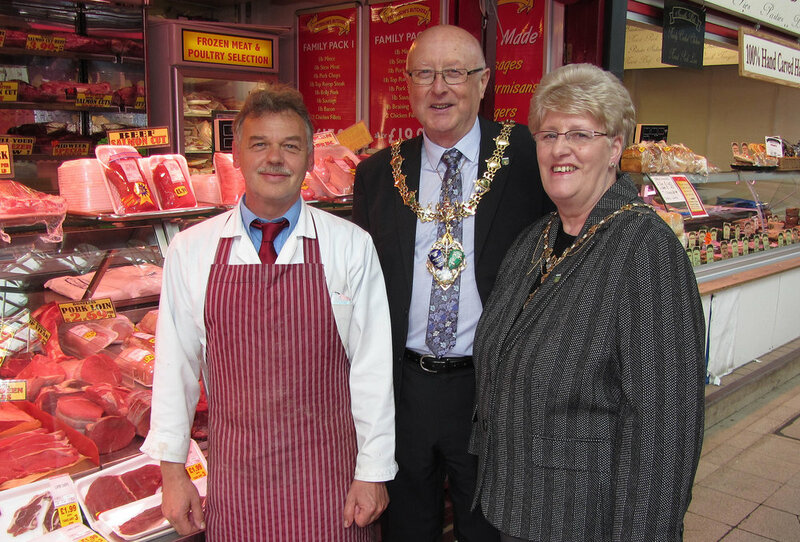 The Mayor and Mayoress, Cllr John Foden and his wife Kath, were hosted by markets manager, Robin Lambert, who introduced them to a variety of traders and explained about the recent progress and future plans for the markets. Amongst the traders that the Mayor met in the indoor and covered market areas were Craig Harper of Patterson's butchers, Deborah Pearson of Diva Jewellery, Alyson Longden of B&A Longden and Sarah Barletta of Everything 4 Petz. In the covered market the Mayor met David Haynes who had taken advantage of the Trade for a Tenner initiative and Russell Lee who had participated in the First Pitch initiative run by NMTF (National Market Traders Federation). Robin commented: It was great to have the opportunity to show the New Mayor how the markets are flourishing and for him to be able to meet a selection of both our established traders and those new to the markets. Both the Mayor and Mayoress were interested to hear the trader's stories and to find out more about our plans to further develop the markets in the future. These plans include the expansion of the Tuesday street market from June 4 with the opening of a new fresh produce section on Upper Millgate, outside the visitor centre, and the opening of the Thursday Bazaar in the outdoor covered market on June 27. The Love Your Local Markets initiative is a national campaign to highlight the importance that markets play in the community and gives those that would like to try market trading an opportunity to give their business idea a go. Activities included a Market Art competition for the best market related photos, drawings, poems and sculptures. Also, as part of the project, local students were offered the chance to try their hand at being a market trader under the College Student Market scheme, and potential traders registering with Rotherham Market for the first time could trade for a tenner on a single general market day. Reviewing the campaign, Robin said: The National Love Your Local Market campaign plays a huge part in raising the profile of markets. Here in Rotherham it was great to see so many new traders trying their hand at market trading. Of particular mention are the South Yorkshire Crafters, who really got involved and made a huge impact when they traded at the monthly farmers market. They are a group of people who create their own crafts due to the popularity SYC will also now have a stand on the Saturday General Market on the second Saturday of each month.